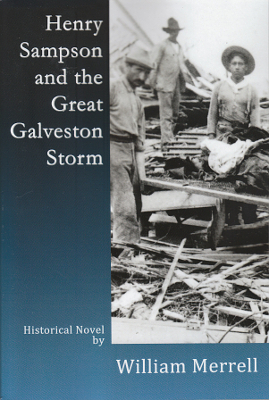 Description: A historical novel of the 1900 storm by local marine scientist Bill Merrell who holds a Ph.D in Oceanography and the George P. Mitchell chair in Marine Sciences at Texas A&M University. Henry Sampson is an ambitious young businessman looking to make his fortune in the city known as the Wall Street of the South. From his office overlooking the Strand, Sampson enjoys a clear view of the busy port which was then controlled by the Galveston Wharves Company nicknamed the Octopus of the Gulf. By way of a romantic interest he becomes involved in a lady's scheme to recover a cache of Jean Lafitte's hidden treasure and encounters a host of historical locals along the way, including Jack Johnson, George Sealy and Isaac Cline among others, all in the week prior to the island's devastating encounter with a hurricane of unimaginable power.200 pages. Viewed: 1,860 times since December 6, 2014.